It has happened again. I broke something. Yet another item has fallen victim to my buttery fingers. This time, at least, it belonged to me instead of my husband. It was one of my coffee mugs. I was minding my own business, washing my mug in the sink. I was holding onto the handle with my left hand, and my right hand was washing the inside of the mug out with a washcloth. That’s when I heard a thick snapping noise and the handle of the mug broke off right in my hand! In my hand! From something as simple as HOLDING the handle! There was no foul play involved- no vigorous washing, jostling, or jarring. I was simply grasping the handle… and not with brute force or anything. Just simply holding the handle. Feeling dejected at another item breaking in my buttery fingers, I set the mug down and took a picture of it. 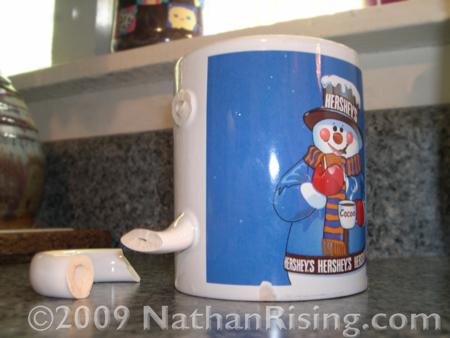 As you can see, the broken handle isn’t the only mishap this mug has had with my hands. You can see a glaringly obvious chip near the handle. I am hoping the Internet will find this as woefully amusing as I did. Hey, if you can’t beat ’em, join ’em! I can’t seem to stop breaking things, so I must laugh at myself or I will end up breaking my own sanity!